Life With 4 Boys: Plan a Summer Party for Under $100! 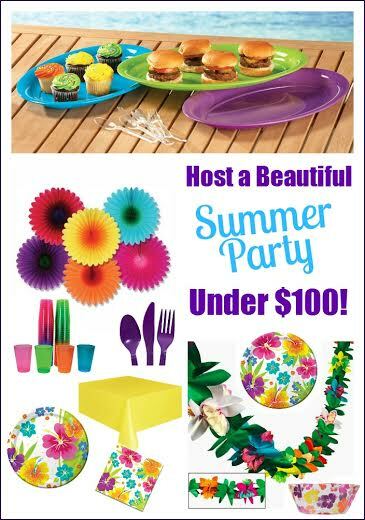 Plan a Summer Party for Under $100! Summer is here, and with it come plenty of parties and BBQ's with family members and friendly. Unfortunately, these events can often be quite expensive, and if you are anything like me, you are trying to save for the holiday season that is just around the corner. So what are you to do? Shop on a budget of course. The products below can help you pull together the perfect summer picnic for under $100! Set the party mood from start to finish with luau party supplies from Creative Converting. Fluted floral bowl is perfect for chips, dip, or candy. Add a decorative touch to any tropical themed occasion. (Cost is $3.15 add-on item at the time of posting). This looks like a great party plan. I love the vibrant colors you choose. This is totally awesome. I love your party ideas. Those colors are really great too. I love the theme and colors, we use a lot of paper plates and plastic utensils here, It's just so much easier. I love all the bright colors. This would be perfect for a summer party! Love the theme and colors. I agree it's completely possible to plan a party with decorations and serving pieces on a budget. We spent just a bit more than that on our daughter's graduation party and that included the food as well! The flower fans and fluted bowl are so cute. I love how you just chose simple but bright pieces - perfect for summer and playtime in the sun! I love these party ideas. I'm a sucker for bright colors and would love to host a party with these items. A lot of those things could be reused for several parties during the summer. That would make the parties even more affordable. So many great products and ideas for a party! Love all the colors. This makes me really want to throw a summer party! I love that it all costs under a $100, too! I really love the bright summer theme you chose and I am a fan of any reason to party!